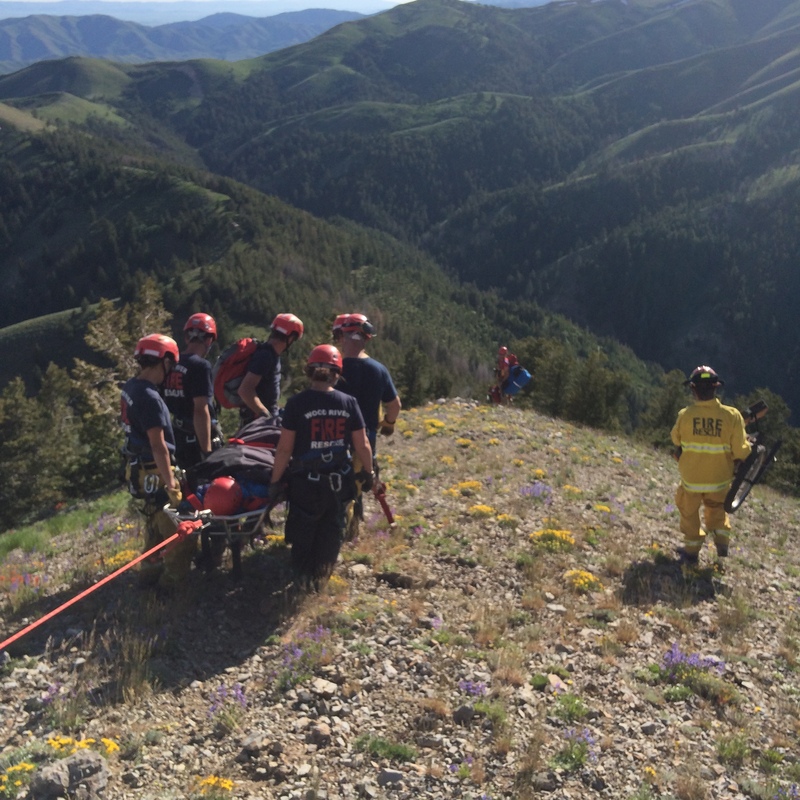 On June 13, 2016, three fire departments responded to a technical rescue in the Wood River Fire & Rescue service area in Idaho. The patient had tendon damage from falling, as well as some broken leg bones. The injury happened in the backcountry, but Wood River’s extraction team knew the general area—west flank of Kelly Mountain—and headed out immediately. On their way to the location, the Hasty team (first group sent on a rescue, to determine patient’s condition and plan the overall rescue) received a set of updated coordinates, which they then mapped in Gaia GPS. The update didn’t add up—the new location added 10 minutes of flight time to the rescue, which indicated a drastic error. “We know these aren’t the right coordinates because I can see this isn’t anywhere near where these people said they were,” Bass Sears said of the erroneous points. Since the hikers frequently adventured in the area, the team knew to stick with the initial Kelly Mountain spot. Review of the dispatch calls later revealed that a simple switch between Degrees Decimal Minutes and Decimal Degrees coordinates accounted for the issue. Once the Wood River team reached the injured patient, they established a need to carry them via a Stokes litter, and descend 1500 vertical feet to the nearest dirt road that was accessible by air transport. The silence of their initial ascent quickly filled with tons of chatter about the terrain, the maneuvers required to successfully complete the rescue, and radio traffic. A team of 12-14 people assigned to the rescue on foot, only 2 of them paid full-time employees, worked together to deliver the patient to safety. Sears said that even an hour or two planning for the rescue would have eliminated airlift assistance that day, but using coordinates and Gaia GPS to develop their plan meant the difference. After 6-8 hours of transport, and four helicopter loads of rescue equipment and personnel dropped at the staging area, they safely delivered the patient to the air ambulance. GPS technology changed emergency response work forever, but SAR and Fire departments can’t provide expensive standalone GPS units to the thousands of volunteers across the country—that’s where Gaia GPS comes in. At the end of last year, Gaia GPS started a pilot program to share the app and GaiaPro subscriptions free to emergency volunteers, like wildland firefighters and search & rescue responders. In the last 10 months, over 1,000 people have received this powerful navigation tool at no cost, and gone on to use it in their lifesaving work. If you have questions about how Gaia GPS can help keep you safe in the backcountry, write to us at support@gaiagps.com for more information. Ruthie works on the communications team at Gaia GPS. She loves exploring the outdoors and camping with her husband and daughter. Hey Buddy!, I found this information for you: "Gaia GPS Assists in Backcountry Rescue". Here is the website link: https://blog.gaiagps.com/gaia-gps-assistsckcountry-rescue/. Thank you.